Window cleaner can be a game-changer for your housekeeping routine. 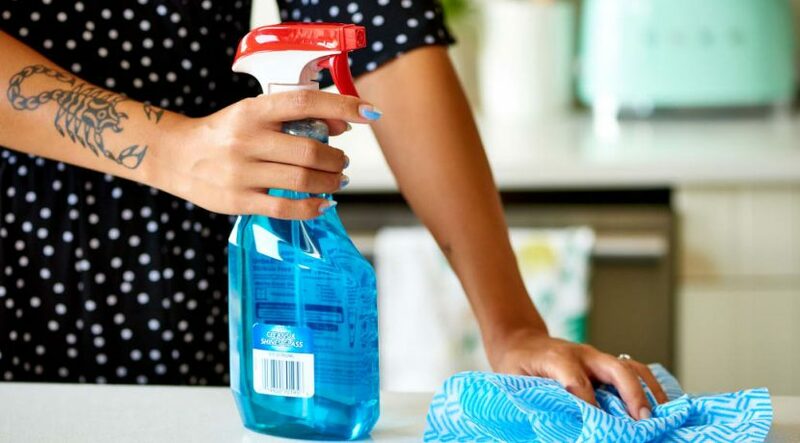 Along with cleaning everything from your windows to your shower tile, this bright blue household staple is slightly less abrasive than most other multi-purpose sprays—making it great for use on more fragile surfaces. Unfortunately, however, there are some things you should never use window cleaner on, no matter how contradictory it may seem. So before you get carried away spraying down your stuff with window cleaner, read ahead for seven places you’ll definitely want to steer clear of. In addition to harsh ingredients like ammonia, most window cleaners are packed with chemical compounds that can cause irreversible damage to delicate electronics—especially laptop screens and displays. Your best bet is to clean your computer screen with a soft microfiber cloth and distilled water. Contrary to what you may have heard from some of your favorite supermodels—Ashley Graham and Windex, anyone?—applying window cleaner directly to your skin is definitely a big DON’T. The chemicals in window cleaner can irritate and even burn your skin, and besides, who wants to smell like ammonia anyway? Before you start you next marathon cleaning session, remember that many popular cleaning sprays contain chemicals that are fine when used alone, but dangerous when combined. Case in point: window cleaner—which contains ammonia—and bleach. When mixed, bleach and ammonia produces a toxic gas called chloramine, which means you should never use window cleaner with anything containing bleach. While glass cleaner can work well on certain countertop surfaces (like laminate), repeated use on delicate stone surfaces, such as granite and marble, can actually cause permanent damage. 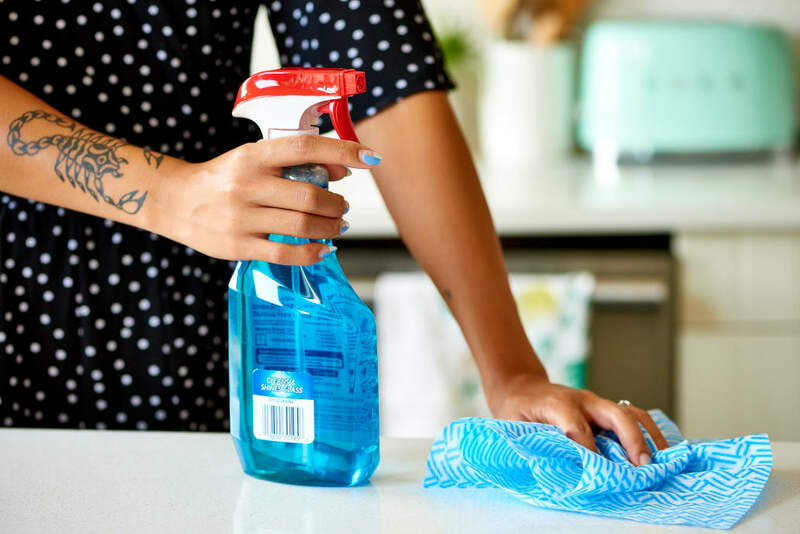 Not only can the chemicals in window cleaner leave behind unsightly soaked-in stains, they can break down the sealant protecting your countertops, ultimately dulling the shine of the polish. Your best bet for your stone counters is a dedicated granite cleaner. Similar to your laptop, your HDTV screen is not a place you want to douse with window cleaner. Turns out that it’s easy for the cleaner to seep through the crevices of your television panel, and result in permanent liquid damage—aka dark unsightly streaks— that will destroy your beloved HDTV screen. Better to stick with a microfiber cloth and duster when removing smudges and dust from your TV. While window cleaner can be used in small doses to clean hardwood surfaces with thick finishes and sealants, such as hardwood floors, when used on fine wood surfaces, including veneered coffee tables or unpolished bookcases, window cleaner can leave drip marks and unsightly spots. If you thought your car windows and windshield were safe to clean with glass cleaner then think again. Not only can it potentially leave streaks and foggy spots that could seriously impair your driving, ammonia-based cleaning sprays can break down the tint on your car windows, causing it to peel over time.